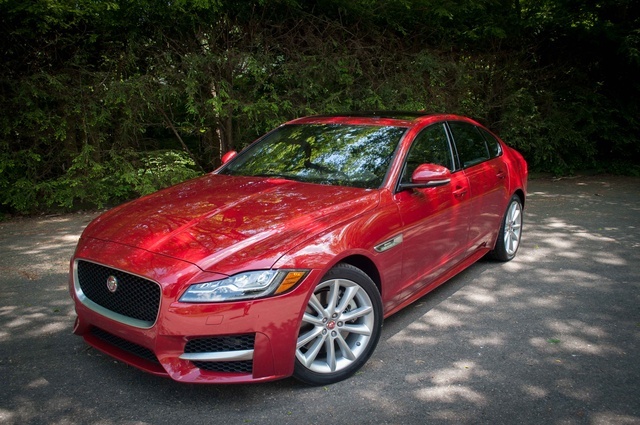 Jaguar’s 2017 XF midsize sports sedan carries the weight of the company on its shoulders. Making up more than half of Jaguar's sales, the XF needs to be a very special vehicle--and it is. 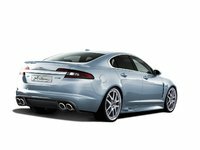 Redesigned for 2016 and entering the 2017 model year with minor updates, the XF looks to continue its strong sales while Jaguar fills in the rest of its model lineup. Jaguar is also re-aligning its price points, and the 2017 XF seems to hit the sweet spot for midsize luxury sedans squarely on the mark. We’ll circle back to the price issue later. For now, what makes the XF stand out in such a mature segment? Aluminum construction for one. The 2017 model's aluminum-intensive chassis, suspension, and body panels makes it between 150 and 250 pounds lighter than the prior generation. And then there are the supercharged engines. The 2017 XF will use a 340- or 380-hp supercharged V6, and a high-torque 2.0-liter, 4-cylinder diesel engine is planned for 2017 as well. There is currently no V8 announced, but that could change. In any case, the gasoline V6 is a splendid match for this midsize sedan, and the 2017 XF drivers will not long for additional power and torque. The only available transmission will be an 8-speed automatic with paddle shifters; despite a vocal minority that thinks a stick shift belongs in every vehicle, an automatic is probably a better choice for a sedan like the XF. The 2017 Jaguar XF would be an interesting addition to the segment based solely on its aluminum construction and supercharged engine, but its looks make it even more enticing. The new bold front grille and bumper design feature large lower openings on each side, and the mesh grille seems to want to tell you this is no commuter car. Jaguar’s J-blade LED lights are sleek and shapely, drawing the eye along the contoured, long, and low hood. The hood’s center power bulge compliments the assertive appearance of the front clip. As good as the front is, the side view is actually the XF’s best angle. The car appears long and sleek, with side trim on the front fender acting like an arrow pointing rearwards. At the back, the upturned trunk lid and thin spoiler offer a modern and fast look. The taillights wrap around the sides and toward the center, and their pinstripe lighting effect gives the car a compact look that is emphasized by the proper twice-pipes exiting from a blackened section of the rear bumper. Inside, the 2017 XF features premium materials, including modern aluminum trim options and an almost excessive use of leather on the dash and elsewhere. The large center infotainment screen is supplemented by an information display in the gauge cluster. Unlike many luxury brands, Jaguar offers a touchscreen interface instead of an overly-complex mouse, a move we applaud. Seating is proper for the class, with sport buckets that aren't overdone in an attempt to resemble racing seats. Optional suede microfiber and Taurus leather offer luxury with style, and other notable interior elements include LED lighting and a rotary transmission-selection knob. 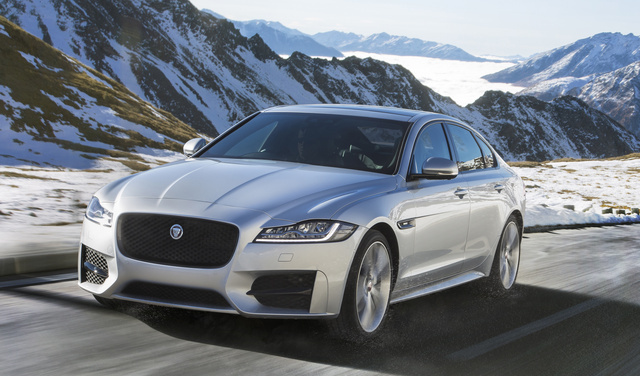 Jaguar will offer the 2017 XF in four trims, all with optional all-wheel drive (AWD). The base Premium starts at about $53,000 with rear-wheel drive (RWD), and the Prestige adds full leather and navigation, among other amenities. The R-Sport has its own body kit and adds more sporty trim, and the flagship S includes the Adaptive Dynamics package from the company’s F-TYPE sports coupe, allowing the car to sense the road and driving conditions and automatically adapt the suspension's feel to match. The XF S will top out near $70K when equipped with AWD and all options. Jaguar is also trying hard to provide customers with a very special ownership experience. The company’s Elite Care promises no out-of-pocket expenses for routine maintenance during the first five years of ownership. Customers taking part in a J.D. Power survey this past year even ranked Jaguar number one in dealership satisfaction. The XF is one of the world’s best midsize sports sedans, and those shopping for a vehicle in this class will appreciate the fact that Jaguar is thinking about more than just the car itself. What's your take on the 2017 Jaguar XF? Have you driven a 2017 Jaguar XF?